At 8:45 p.m. on the evening of August 25, the planets Venus, Mars, and Saturn are seen low on the western horizon. If you look low in the western sky just after sunset, you will see three planets in an irregular row: from left to right, Venus, Mars and Saturn. Venus is the brightest of the three and, with the use of a telescope or binoculars, appears as a narrowing crescent. Astronomers use a magnitude scale to measure the brightness of objects in the sky, with larger numbers indicating fainter objects. The brightest objects in the sky are magnitude 1 or less; the faintest objects that can be seen with the naked eye are magnitude 6. Currently, Venus shines bright at a magnitude –4.4, with Saturn at magnitude 1.0 and Mars slightly fainter at magnitude 1.5. This sky map shows where to look to spot all three planets tonight, weather permitting. 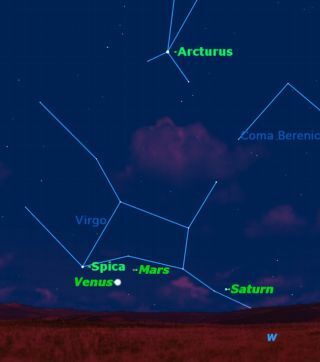 Just to the left of Venus is the star Spica in the constellation Virgo, like Saturn magnitude 1.0. Riding high above all four is the brighter star Arcturus in Bootes, magnitude –0.1. Because Venus is lit by the sun from behind, its crescent shape, as seen in a telescope or binoculars, is getting narrower, like a waning crescent moon, as it moves in front of the sun. Any telescope will show the crescent shape, and it is even visible through binoculars. In this part of Venus' orbit, the view does a balancing act between the planet's decreasing distance from the Earth (which makes it look brighter) and the decreasing width of its crescent (which makes it fainter). The two balance out Sept. 23, when Venus will be its brightest of this year, magnitude –4.6. The planet will then start to drop ever closer to the sun, passing between Earth and the sun on Oct. 29. Venus will pass just south of the sun at this time. But Venus will pass directly in front of the sun on June 5, 2012. This transit of Venus last occurred June 8, 2004, and won’t happen again until December 2117. Returning to the view tonight, after the three planets in the west have set, turn around and face the east: You will see the moon rising, one day past full, shortly followed by the planet Jupiter to its left. So, just as three planets exit stage right, a new planet enters stage left. If you miss these events tonight, try again tomorrow night, but don’t delay any further, as the planets move on without any regard for human observers. If you’ve been following the movements of the planets over the last few weeks, you will have seen Mars, Saturn and Venus shift from a tight triangle on Aug. 5 — with Mars and Saturn to the left of Venus — to an Aug. 10 arrangement with Venus in the middle. Mars and Venus were closest, less than 2 degrees apart, on Aug. 18, and have now drawn apart so that the three planets appear in an irregular line. This is about as close as planets ever get to aligning in real life. For observers in the Northern Hemisphere, Saturn is now getting perilously close to the sun and will soon be lost, reappearing at dawn in November.